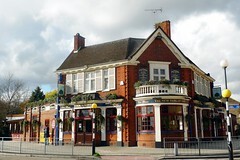 Wetherspoons pub in Fullwell Cross/Barkingside. Entry is into a traditional bar area with four fruit machines and room for standing-up drinking. It opens up further back into a conservatory-like area with exposed ceiling beams and windows with stained-glass detailing. There are two or three booths tucked against one wall, and there's also an outdoor seating area. It has two banks of handpumps on the bar; on Kake's July 2013 visit one of these had four interesting-looking real ales and the other had the usual boring ones you find in Wetherspoons (Ruddles etc). A pint of lime and soda was £1.05, and the staff member asked me to taste it to make sure she'd put enough cordial in, a nice touch. There were lots of people in on a sunny Friday afternoon, but the pub is quite big so there were plenty of tables free. No music was playing; instead, there was a nice buzz of conversation. Accessibility: A step to get in, but it's step-free to the bar, seating, and toilets once you're in. Last visited by Kake, July 2013. Opening hours taken from the Wetherspoons website, July 2013. Page last edited 2013-07-14 10:38:21 (version 1).